I have recently found an off-the-beaten-path place that has one of the best burgers I have ever had anywhere. The restaurant is Cruisin’ in Gilberts Illinois. It’s on RTE 72 (Higgins Road) about 2 miles west of Randall Road. They serve an Angus Beef burger that according to the owner is an 87/13 blend of fresh, never frozen Angus beef. I’d guess it’s about 10 oz. I prefer mine rare, and each of the 5 visits I have made, they have nailed the temperature. I have had friends with me on a few visits, and they have always nailed the temp request, from my rare, to a co-workers medium well. The meat has a nice grilled char, and a nice beefy flavor. They have a nice menu with lots of other sandwiches including a pulled pork that was reported to be good. They also have broasted chicken that I will try someday when I have the discipline to order something besides that burger. They also have great sweet potato fries, and several good appetizers like the fried pickles. Not sure if anyone here has tried this place, but IMHO, it’s a gem. As to question about eating at Goldyburgers. I have never ordered anything but a burger there, but I have nibbled on things my kidz have ordered. Let me say this, it's not like a grilled cheese with bacon is a good thing to eat, but is it worth running out for? That said, we do always order the "MZO" combo of decent enough fried mushrooms, zuchinni and onion rings. Also, you have to eat a Goldyburger less than medium to get a good burger there. I know. 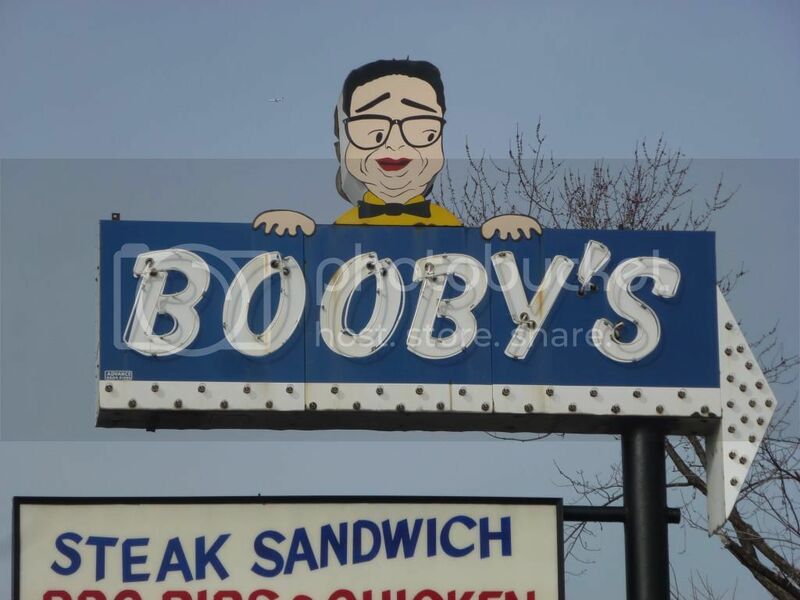 Stopped at Booby's today. Pretty good! I usually like the grease dripping down my chin but the patty was filled with flavor. The BBQ sauce a nice tang as well as the slaw. Marco wrote: Just want to say that I wandered into Fatty's on Clark and, for once, being such a picky eater, was very pleasantly surprised. It is seriously *good*. However, I was impressed with my order but it was the Halftime Burger, supposedly the kiddie burger. This burger is everything 5 Guys *should* be but is not: right size, right price, outstanding flavor. It comes with a large portion of fries and a fountain drink for $5. The fries were quite good. The burger, I am guessing 1/4lb, was simply perfect at that price point---I can't imagine what better quality you could achieve. I am usually highly critical of most new gimmick places, but if you can control yourself and shy away from the 1/2 pound monsters, you will be more than satisfied for $5. My only critical remark: the regular size 1/2 pounders start at $9, you could pay even $2 more for just some bbq sauce and onions. They include fries but no drink. Seriously, just buy TWO Halftime Burgers for less money, if you have to eat that much. The Halftime Burger Combo has to be the best deal around Clark nowadays. Hey, what happened to Fatty's on Clark? I went back and they were papered up. Sign said: coming soon. Did I happen to enter a time warp? Even more mysteriously, I saw the same Fatty's sign, "coming soon", in Evanston on Dodge where that korean burger place used to be. Fatty's was closed for a bit doing repairs. As of this weekend they were back open. While I am thinking about it, I had a decent burger at El Famous Burritos on Clark/Greenleaf while waiting for a mid-day Metra train. 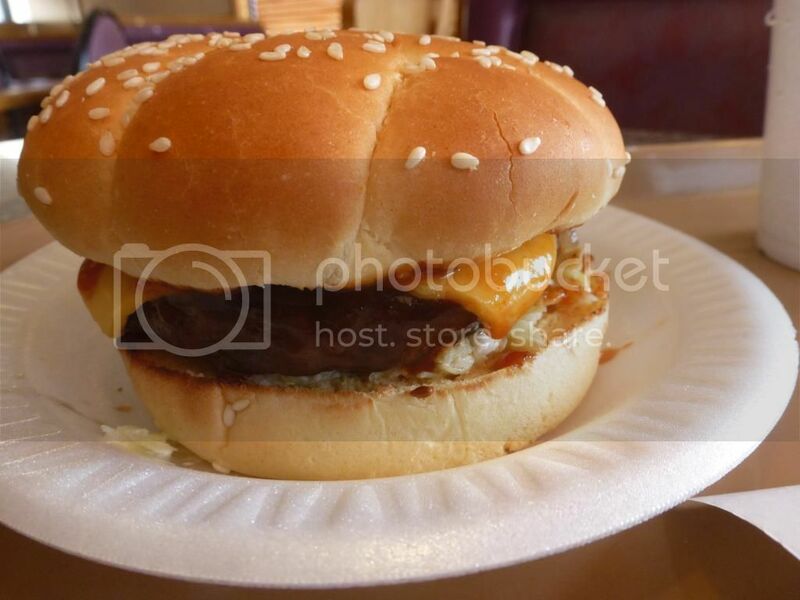 Ever notice how Taquería-Style burgers resemble the original incarnation of the Whopper? The extra wide bun with the thin-wide patty, and fresh tomatoes onions etc, usually topped with the ketchup-mayo combo. It was pretty good for what it was, with fries and a drink for under $5. Esp if you are ever once in awhile nostalgic for old BK Whoppers---which I consider too sketchy now to even venture inside. When circumstances dictate that I must get lunch at one of these many lowest common denominator Mexican places, I am likely to try the burger deal due to this apparent Whopperism. Also, because burrito and taco prices keep creeping up, a sort of hyper-inflation I blame on Chipotle. And because, after all these years, most taco places except for a gifted handful are offering the same-old experience. I'd say, as a general rule of thumb, you are going to get as decent a burger in a Taquería as in a hot dog stand, if not better because of the vegetables and the suddenly sublime realization that you are about to load the bun up with green salsa. I tried That Burger Joint tonight. I was actually intending to hit up Kaufman's but even at 530pm the line was too long, and the people in the line were the classic slow-orderers. Plus you know, I had a quick look at the new prices and $12+ for a deli sandwich seems like a big leap. I don't quite remember but thought I was getting plain corned beef sandwiches for about $7-8 pre-re-model. Anyways, I was impressed with That Burger Joint. I decided the $7 cost of the double patty burger with cheese was worth the risk if a Reuben next door was gonna be $14. I also asked for everything but just the petal sauce as lubrication. *This thing was huge*. The toppings were good particularly the grilled mushrooms and the large sliced pickles. They did not skimp on the included toppings. It felt in my hands as weighty and as formidable as a Kuma burger. The meat itself was quite nice, distinct. The cheese was American but that good kind of American that melts well yet isn't plasticky. Given how wide the burger was on its very large pretzel bun, next time I could certainly get by with the $5 jr single patty burger. Everything tasted better to me than 5 Guys or Epic Burger, and represented a much better value. My double cheese seemed to be about twice the size of the full size 5 Guys---which is nearly the same price for half the chow. 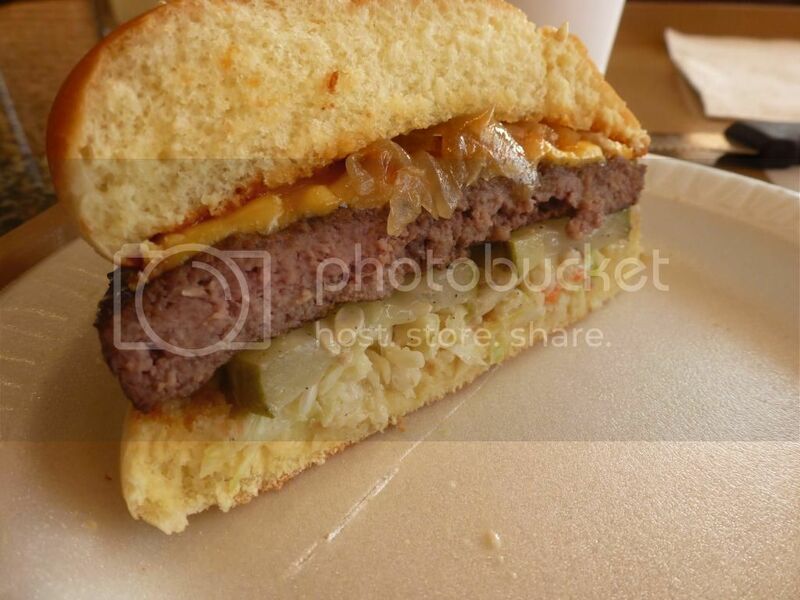 Even though Epic Burger hypes its meat, I thought That Burger Joint was simply better. I'd rank it on par with Everest Burger, but again, twice as hefty. Its not quite in the Edzo's category, but its a contender---and seriously the double patty cheeseburger has to be the biggest "fast food" burger around now. So the quality was right there, and the quantity was shocking. The fries I'd describe as above-average: the skin on type that seem /close/ to fresh-cut. No comparison to Edzo's or WASC, but I'd eat these fries before 5 Guys. Geez, at least you can order a normal $2 portion. I also like the fact they have a $3 hot dog option. I've always found the Oberweis Dairy stores quite pleasant places to sit and get a little treat. The staff on the burger side of the store seemed like they knew what they were doing, and were very confident they could get my order out in 8 minutes despite there being 4 outstanding orders ahead of mine. I actually had the bag in hand 6 minutes after ordering. As long as they don't creep up the prices after getting popular [ ahem, 5 Guys] I'll be back. A little surprised that this place hasn't been mentioned yet. Perhaps because it is a little out of the city? Stopped in today and had some very good burgers! Patties seemed uniform but not frozen. Nice and juicy, seasoned and cooked as ordered. The Build A Burger with Blue Cheese (real crumbles). They have a new series of 1/2 lb specialty burger combo's that are not on their online menu yet. The Bothwell Street Burger. ... with ham and fried egg. You could do a lot worse for lunch. 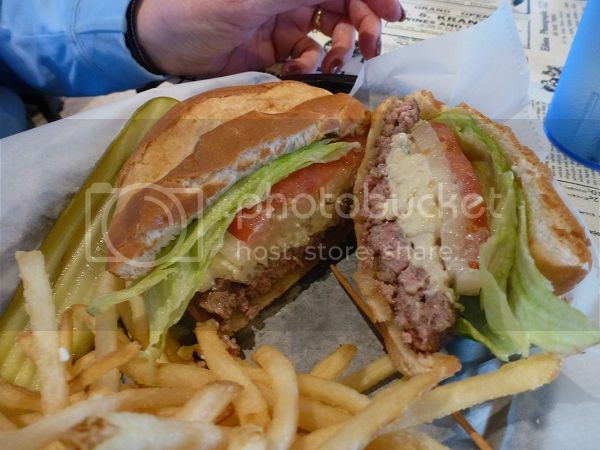 I'm a sucker for a blue cheese burger and that looks like a great one. Panther in the Den wrote: A little surprised that this place hasn't been mentioned yet. Perhaps because it is a little out of the city? I wonder if the name is a reference to twin peaks. FF to 0:40. Last edited by laikom on January 29th, 2013, 8:28 pm, edited 2 times in total. That Twin Peaks reference is the best call I've seen on lth. Period. In 1974 the Bellanca family proposed purchase of the building. After almost a year long negotiation the village voted to surrender the license owned by Zwirblis and issue a new license to Bellanca, Inc. with the understanding that the clientele would be upgraded and not be so prominent in the local police blotter. The business was renamed Lamplighter Inn. With all the paperwork behind them, the Bellanca family opened up the new tavern in November of 1975 and have enjoyed serving it's [ ] patrons. On the other hand, not far from Palatine is a brand new restaurant called Twin Peaks. A whole restaurant devoted to one of the greatest TV shows of all time! I'm looking forward to checking it out this weekend -- I'll dress up as my favorite character (the Log Lady) and anticipate some lively discussions with fellow devotees (opinions on second season continuity can get quite heated!) But, hey, you know the pies will be top notch! You had me excited for a second, then I saw their website and realized it's a hootersesque chain. http://www.twinpeaksrestaurant.com/ Unless I'm (hopefully) mistaken. Hootersesque? That makes sense. The owls are not what they seem. 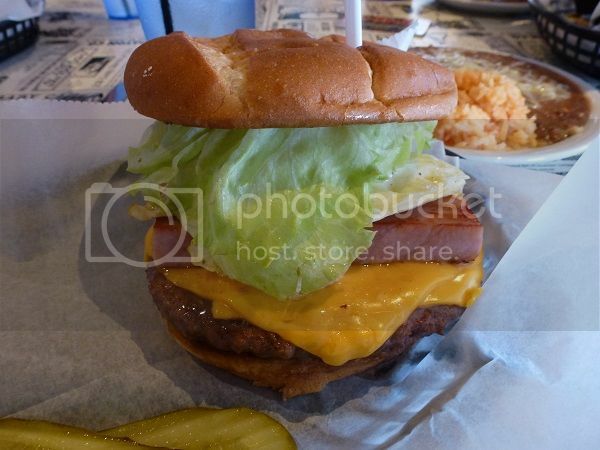 That Lamplighters burger looks a lot like the one I had last night at Donelli's Pub and Eatery. Same bun too. They use fresh ground beef and the burger was so juicy it immediately ran all over my plate. The place itself is a very small dive bar, where I go every Tuesday night for open mic night (I play guitar and sometimes bass there). Ironically Lamplighter Inn has an open mic night I used to go to every Wednesday night. It's a small bunch of regulars at Donelli's, so at the end of the night when we pack up the equipment, we go through the kitchen, so I can see behind the scenes at the food and equipment. I have to say I was pleasantly surprised at the quality burger they serve. I would have expected bottom rung for sure. Fries are frozen crinkle cut, and they also have seasoned waffle fries. Not exactly destination dining, but a solid burger, nice bartenders, and if you are there on a Tuesday night, I'll probably be there to entertain you! I was in Lake Forest to check out some vintage cars with some friends and we ended up at The Lantern. I don't think I'd ever eaten their burgers, which are supposed to be pretty good. Anyway, I ordered their 8oz Lantern Burger (they also have a 10oz) and it was really excellent. In fact my whole meal was kind of like a Bizarro Hackney's. First we had some great onion strings that tasted somewhat like Hackneys and the burger that came out (on a nice brioche bun) kind of looked like Hackney's. Anyway, I was very impressed and will definitely be going back. Hard to believe living in Highland Park most of the time since 1979 that only now am I having this burger which was only about 10-15 minutes away. But Highland Park and Lake Forest are worlds apart if you know what I mean. Anyway, great place, great burger, great onions, I'm going back soon. Kitchen open until 11PM Bar open until 1AM 7 nights a week. Last edited by Ram4 on July 28th, 2013, 7:14 pm, edited 1 time in total. Ram4, not trying to bust your chops, but I notice that there is no place in Lake Forest called The Latern. I thought the word in your post might be a typo, but you spell it that way all three times, including in the final info. There is a place at 768 Western Ave. called The Lantern. riddlemay wrote: Ram4, not trying to bust your chops, but I notice that there is no place in Lake Forest called The Latern. I thought the word in your post might be a typo, but you spell it that way all three times, including in the final info. There is a place at 768 Western Ave. called The Lantern. At the Orlando airport, stopped in the Ruby Tuesday and ordered the "Spicy Jalapeno Pretzel Cheeseburger" before boarding my plane home. High points: 1) perfectly medium rare, 2) very juicy, 3) great beef flavor. Low points: 1) Spicy? Really? It has a chipotle mayo, crispy jalapeno strings and pepper jack, but is spicy in the way a an Adam Sandler movie is funny, "Oh yeah, a couple of these jokes looked like they'd be funny in the preview. But aren't." The server brought out extra jalapeno strings and nacho rings. The strings had no heat at all, and the nacho rings added a mild zing. 2) The pretzel bun isn't what we've seen here as the ubiquitous sandwich roll: dark-glazed but fluffy with big flakes of salt. Instead it's a pale, dense bready thing like a Philly soft pretzel. I think the juiciness I noted is partly from the fact that the bun didn't absorb anything. Overall, the burger looks a lot less tall than the TV ads -- it's about what you'd expect from adverteasing (and thankfully doesn't fighteningly quiver either). 3) Enough lettuce that it looked like my burger was wearing a green muu-muu. For $12.99 (airport price, I'm assuming their mall outlets are cheaper) with a scant few onion rings, it's not a great deal, but even Qdoba charged $7.90-$9.99 for a burrito: I'd probably order one of their non-pretzel burgers in the future, since the beef was really quite good and well prepared. If I was only griping I wouldn't write at all: it's a good patty, but a lousy assembly (and not spicy). Does anyone remember Leikam's Tap on Hwy 45 west of Hwy 21? It was a small pub, family owned that made fantastic burgers. They were farmers and had a lot of land off 21. Their fries were made to perfection and the burger-fry combo was more than what most people could eat. They would even advise two to split the fries. They quit asking my group, as we could not share those without it being a race or worse. "Outback" Betty also had a small salad bar set up with all homemade stuff. I sure miss this place. Puckjam wrote: Does anyone remember Leikam's Tap on Hwy 45 west of Hwy 21? It was a small pub, family owned that made fantastic burgers. They were farmers and had a lot of land off 21. Their fries were made to perfection and the burger-fry combo was more than what most people could eat. They would even advise two to split the fries. They quit asking my group, as we could not share those without it being a race or worse. "Outback" Betty also had a small salad bar set up with all homemade stuff. I sure miss this place. I remember squeezing in at their crowded little bar for their great burgers. A number of co-workers went there regularly. One girl referred to it as "The Dumbshit Club." I don't remember why. I miss it too. Well I had to laugh at that. It was a cast of characters in there. I frequented often. Pat and Betty were the owners. When they sold some of the farm land on Milwaukee Avenue, they took a trip to Australia. Betty came back wearing one of those Aussie Outback hats, hence, Outback Betty. They had one son who bartended occasionally, his knickname was Dumbshit. He was bartending once with his face all skidded up, his pants open due to the pain endured getting throw (skidded across a gravel parking lot at that CW bar up on Milwaukee Avenue. Then there was the other son we named "Baby Huey" as he was a cross eyed large person. He is serving life right now. The youngest brother, we named "Sausage Man." Once we were there on a Sat morn with severe hangover. Ordered a large breakfast (6 egg omelet, silver dollar spuds, a piece of ham with the bone in strapped across the top of aforementioned and four pieces toast). That day there were two couples across from us at the bar (small place) eating when Sausage Man came out of the kitchen with a platter of about 3 dozen pork sausage links with abundent toast on top. We thought it was a family style platter for those two couples until he passed them, sat at the bar, and ate it all. Hence, Sausage Man. Once we were there when UPS delivered some boxes to an exited Sausage Man. It was one of those kits from the back of comic books with "equipment" for the end of the world survival. Pat looked at us and said that kid will never get it. Quite a cast of characters from the other side of the bar at times also. Great stop. The opening of Burger Boss in Lakeview (via Elmwood Park) has gone largely un-discussed. Maybe we're just at that point where newly opened burger focused spots aren't news anymore. I'd driven past their original location on North avenue many of times but due to the fact Johnnie's is a just a few doors down, I never even considered trying it over that. With this location opening it became a much closer option and thus a place I remembered to go try when the need for some beef hit. I went with their signature Southport Boss Burger which takes two thin patties (1/3 lb total) and adds Applewood Smoked Bacon, Two Slices of All-Natural Cheddar, Lettuce, Tomato, Boss Sauce, Pickles and Grilled Onions onto a perfectly fluffy/strong Brioche bun. I very much liked. Even with Red Hot Ranch nearby, Burger Boss is going to have a spot in my rotation. I had the opposite experience with Burger Boss, tried the Southport Boss the first time, didn't really get any beef flavor out of it. Second time around I ate in, had the Classic without mayo. 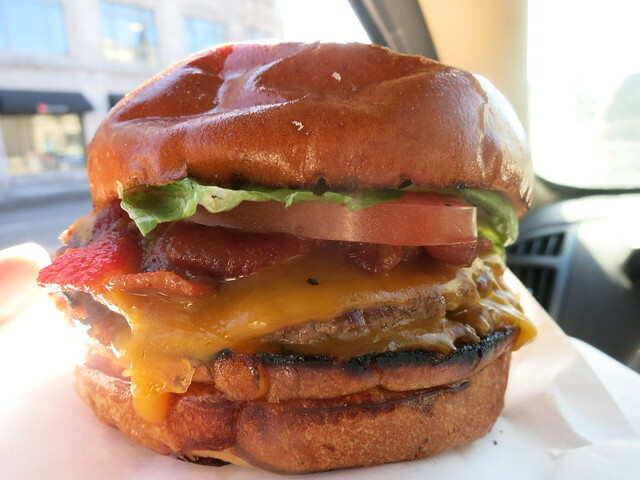 People were nice and the fries were good, I'll give them a third try, but in the area I find the burger at RHR more flavorful and a much better bang for the buck. Sadly there are a couple I haven't eaten on this list, and on my way back in from Itasca, I seriously thought about a 1,2 punch of Edzo's and RHR to knock them off the list. Alas, work beckoned, and I will have to dream about these beauties until this weekend, when I may attempt, yet again, to tackle both. I would recommend against a 1,2 punch of edzo's and RHR....unless you want an early heart attack. One at a time, please. Especially because you want to try the other stuff they offer (shakes at edzos and fried shrimp at RHR). bnl wrote: I would recommend against a 1,2 punch of edzo's and RHR....unless you want an early heart attack. One at a time, please. Especially because you want to try the other stuff they offer (shakes at edzos and fried shrimp at RHR). Boo! No true eater would ever have a problem with a 1-2 punch of Edzo's and then Red Hot Ranch. But I agree that if you want to get other things on the menu, then you should take it easy. I would have Edzo's for lunch and RHR for dinner on the same day! I did get to Edzo's but not RHR this weekend. OMG, that's a tasty burger.